No one wants to make mistakes at work, but it inevitably happens. If it happens too often, though, that’s when it can cause a problem. And, if you’re a dedicated employee who really wants to be the best at their job, you don’t want things to get to that point. That’s why you have to learn from the mistakes you make to keep them from happening again. 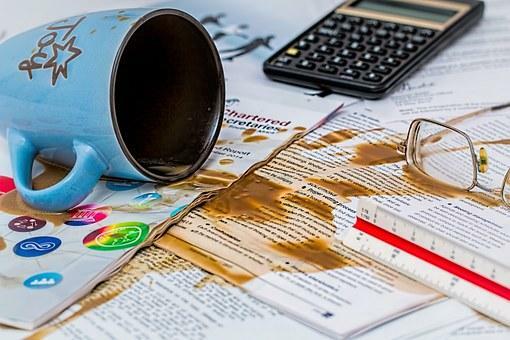 Here are a few ways you can stumble less with work mistakes. While technology can certainly help workplace productivity, it tends to increase the amount of distractions as well. Of the 80% of workers who own smartphones, 70% of them keep them within eyesight when they’re at work. If you’re constantly seeing messages and social media notifications popping up, you’re going to want to check them. Distractions lead to mistakes. If you aren’t totally focused on the task at hand, you increase the risk of messing it up. Keep your phone in your car, locked in a desk drawer out of sight or in an employee locker if you have one. Mute work emails that are constantly coming in and only check them at certain times. Technology isn’t the only distraction, though. Tell your friendly coworker that you can’t have 15-minute cubicle chats every time he walks by. Bring headphones to eliminate the noise of loud coworkers. Eliminate everything you can that could keep you from totally focusing on work. Making a to do list may sound silly, but they come with some serious benefits. Writing things down simply helps you remember them better. Having a list taped to your computer monitor where you’ll see it often will remind you of the things you have to do. If you find you’re missing important steps or tasks, this is a good way to make sure you remember them. If you do find yourself getting pulled into meetings or getting away from your tasks, a list can help get you back on track and in that mindset. You can write out your process for certain tasks and highlight any problem areas you have. Add in directions that your boss gave you or talk to them about the proper practice so you can make sure you do it correctly each time. Sometimes the pressure of deadlines and wanting to get things done can get the best of us. When we’re too focused on speed, accuracy can slip through the cracks. Errors start happening, and entire parts of the project have to be redone. It’s much better to put your focus on being accurate. It may take a little longer to get a project done, but it’s better than the whole thing having to be done over because it’s full of mistakes. Speed comes with practice and repetition. You’ll naturally get faster the more you’re doing a task! When you get caught up in a task, it’s easy to overlook little mistakes. When you’re finished with your work, go over it to make sure everything is right. You might see things you missed the first time around. Another good thing to do is to have a coworker or supervisor look over your work as well. A pair of fresh eyes can do wonders. We’re more likely to see mistakes in others’ work than our own, so they might find things you missed even on your double-checking round. This is one reason why typos are so hard to catch. Our brains become familiar with the work and overlook small things. You may think you work best when things are down to the wire, but putting them off until the last minute means you don’t have time to double-check and correct any mistakes you did make. It also means you’re rushed, so you’re likely to focus on speed instead of accuracy. This heightens the potential for mistakes even more. Instead of procrastinating, learn to push yourself to be productive every day instead of at the last minute. It’s still good to take breaks — in fact, they’re necessary for productivity — but don’t take ones that are excessive. This is another time where lists can come in handy. They give you tasks to do every day so you keep busy and don’t put things off as much. Asking your boss or supervisor questions can be daunting. But they would much rather have you asking questions than making mistakes that cost the company time and money. Don’t be afraid to ask them a question if an issue comes up. It’s nothing to be embarrassed about. Asking questions shows you want to understand things better and you want to learn. Those are always good qualities for employees. It shows you care about the work you do and you want it to be as perfect as possible. You want to make sure things go smoothly. That’s something your higher-ups are going to respect. Don’t blame mistakes on coworkers or the technology you’re using. Own up to what you did. This can be a lesson for both you and your coworkers. You aren’t going to learn from a mistake if you’re just focused on finding someone else to blame. Owning up to your mistakes shows you’re honest, and people will respect you for that. A good boss will help explain what you did and how to fix it so you’re aware of it the next time. Take notes if you need to, and do everything you can to make sure this mistake doesn’t happen again. Mistakes will always happen. It’s how you learn and grow from them that matters. Take time to see what’s causing your mistakes and make changes. Eliminate distractions and things that can drive you to mess up more. You’ll be making mistakes less and less as time goes on!